The “outlaws” in the Jardine's Four Banditos Gift Box are only guilty of being sinfully tasteful . . . who could blame them. 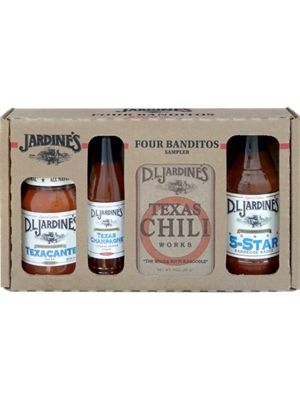 The Four Banditos Gift Box includes your choice of any Jardine's salsa, a Jardine's hot sauce, a Jardine's Chili Mix & any Jardine's BBQ sauce or marinade. Take a delicious walk on the wild side! One taste and you’ll understand why Jardine's is always a best seller. Texas Champagne Hot Pepper Hot Sauce 6 oz.